Very rare adaptation! It is the lens for macro or very close portrait pictures only! No aperture. No scratches on the glasses. Many transparence spots on the front glass coatings- no effect on the pictures. 100mm/0,73-0,8 lens with four adapters for: Canon M, Nikon 1, Sony E Nex, Samsung NX Mini mounts. Very rare adaptation! It is the lens for macro or very close portrait pictures only! No aperture. It also feature new UMC (Ultra Multi Coatings) which aid the very high level of light transmission, and adds further resistance to flare and ghosting. At F1.4 great images can be obtained, which is perfect for portraiture and low light shooting. Just like all the other Samyang lenses, this product is also made of the anti-reflective UMC coatings to improve the contrast quality and faithfully reproduce all the colours. Weight (for Canon EF): 539g. INDUSTAR 50-2 (F/3.5 50mm) m42 SLR LENS. 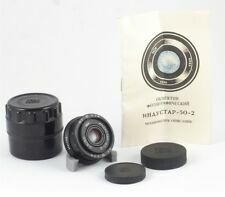 Industar 50-2 is Soviet analog of Zeiss Tessar lens. Without dust, haze, fungus, mold, separation. CLEAN AND CLEAR. 500>1000g - 21 USD. 250>500g - 16 USD. 1kg>2kg - 25 USD. Ideal for amateur and professional photography. Samyang 85 mm is an ideal portrait photography lens.